Another round of I-5 repairs will block the northbound lanes this weekend, from the West Seattle Bridge to the convention center. Mid-July is here, which means almost no chance that rainfall will spare drivers from this weekend’s gantlet of road-repair closures. 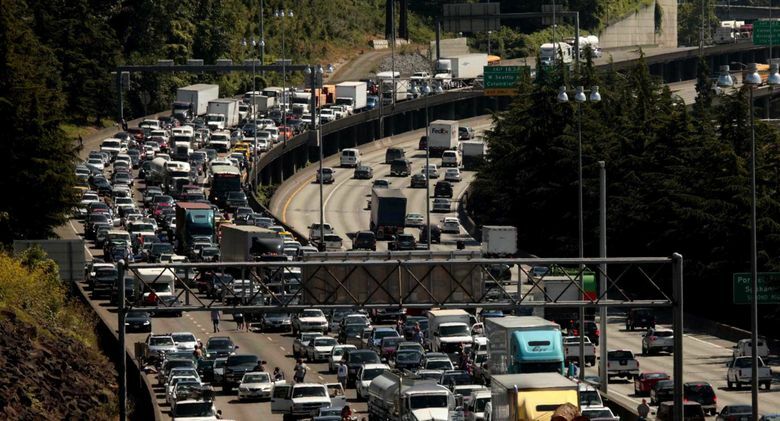 • Interstate 5 northbound will close entirely at Sodo for more “Revive I-5” repairs, from 8 p.m. Friday until 5 a.m. Monday. Drivers must exit at or before the West Seattle Bridge offramp. After that, a two-lane closure is scheduled Aug. 10 to 13, and the state will need another weekend or two of partial closures, said spokesman Tom Pearce. This weekend, the express lanes will point south, since there’s no traffic arriving from Sodo. That will help southbound motorists while two lanes of the Ship Canal Bridge deck are repaired Sunday from 2 a.m. to noon. Motorists on I-90, Columbian Way, Spokane Street and downtown can reach northbound I-5 using the collector-distributor lanes, to the right of the mainline. • Highway 2 westbound will close for asphalt repaving, from Lake Stevens to Everett, between 7 p.m. Friday and 4 a.m. Monday, in the first of six closures through September. Weekend paving has been canceled four times by wet weather, but this time skies will be mostly sunny, the National Weather Service says. • Interstate 90 westbound remains clogged by bridge resurfacing west of Snoqualmie Pass. Traffic squeezes into just two lanes, one of which detours via the eastbound roadbed. One- or two-hour Sunday delays are typical. WSDOT expects to finish before the Labor Day weekend traffic crush, said spokeswoman Meagan Lott. That was supposed to happen last year, but contractors continued several weeks past the deadline. Also, some eastbound lanes will close in places, from Issaquah to just past North Bend, for concrete repair or replacement. Farther east, new roadway along Keechelus Lake should be done by October, all the way to Price Creek near Milepost 63, said Lott. The final layout provides three lanes each direction, topped by the state’s first wildlife overpass. • Aurora Avenue repaving begins this week along 8 miles, mostly nights and weekends, through next year. • The Seattle-to-Portland Bicycle Classic will bring 10,000 riders and support vehicles through a 205-mile route Saturday and Sunday. Busy spots include West Valley Highway through Kent, and the Lewis and Clark Bridge at Longview, crossing the Columbia River.